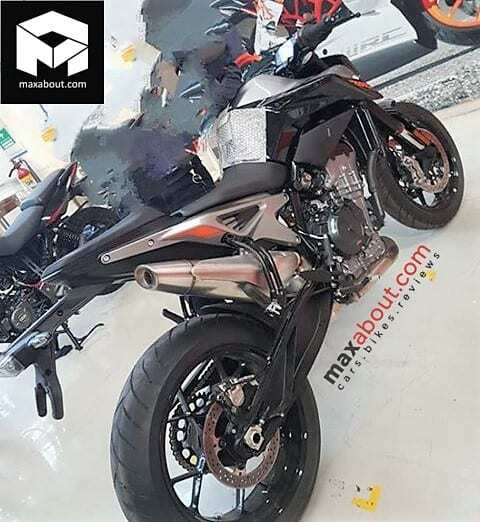 The KTM 790 Duke has started to arrive at dealerships and motoring portal, Maxabout, has shared the first images of the motorcycle at what is claimed to be an outlet in India. The motorcycle was reportedly snapped in the warehouse and it would be put on display post the launch. The Bajaj Pulsar in the background is equipped with a saree guard, a feature that is mandatory equipment on all motorcycles sold in the Indian market and thus it confirms the fact that the 790 Duke was indeed spotted on local soil. 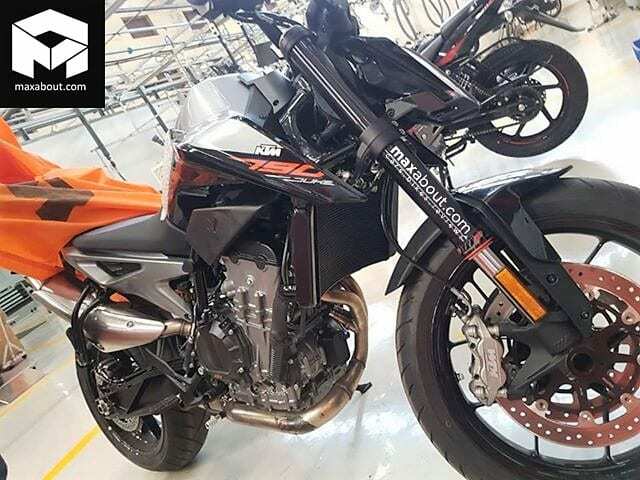 The KTM 790 Duke is claimed to have arrived at a dealership in India. The saree guard equipped Bajaj Pulsar in the background confirms that the motorcycle was indeed spotted in India. Regular readers would know that select dealerships have already commenced the unofficial bookings for the upcoming middleweight motorcycle for a token amount of INR 30,000. IAB understand that the bike is likely to come out well within the first half of the year. Deliveries would most likely commence a month after the launch. The motorcycle will arrive in the country through the CKD route and the assembly will take place at Bajaj’s Chakan plant in Pune. The 790 Duke is expected to carry an ex-showroom tag of INR 8.5 lakh while the on-road prices could go up to INR 10 lakh. The India-spec KTM 790 Duke is identical to the international model and thus, the aggressive price tag will get buyers a comprehensive feature list that will include a full LED headlight, TFT display with Bluetooth enabled smartphone integration, two-way Quick-shifter, Motorcycle Stability Control, Cornering ABS with Supermoto mode, and Motor Slip Regulation (MSR). Power comes from a 799cc, liquid-cooled LC8c parallel-twin motor that churns out 105 PS of maximum power and 86 Nm of peak torque. The engine is mated to a PASC slip-assist clutch enabled 6-speed transmission. Ride-by-wire delivers multiple riding modes. Hardware specifications include 43 mm USD front forks and an adjustable mono-shock – both sourced from WP – and stopping power comes from twin discs at the front and a single disc at the back. The motorcycle is expected to be launched in India in the first half of 2019. The ex-showroom price expected is INR 8.5 lakh range. The motorcycle will compete against the likes of the Triumph Street Triple range, Ducati Monster series, Kawasaki Z900 and the Suzuki GSX-R750. The motorcycle has an edge over its rivals in terms of features although it would not be the most powerful middleweight in the country.